You’ve heard of Bank of America before – after all it’s the second largest bank in the U.S. based on assets and it is number 7 on Forbes Magazine‘s list of the largest companies in the world! Whether you’re a long-time Bank of America customer or you’re just considering their credit cards because you’ve heard they have great options, it’s important to understand the benefits and drawbacks of each of the cards so that you can choose which is best for you. Bank of America’s corporate headquarters are located in Charlotte, North Carolina and the company has a significant numbers and options when it comes to credit cards. In fact, they are the fourth largest credit card issuer in America. That’s because their cards are known for their amazing benefits. So just what are those benefits? While each card offers unique perks all of the cards offer some common benefits as well. For example, some of the benefits of getting a Bank of America credit card are that if they use chip cards which provide added protection to your account and the cards offer online shopping protection, overdraft protection, FICO score monitoring, and online and text banking. They also have the option of creating account alerts in case of fraud or to monitor your balance. That makes their credit cards both very helpful and quite high tech. Wondering about the particular benefits of each of the cards? 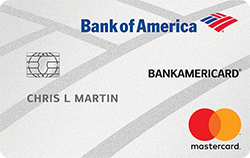 Here is everything you need to know about some of Bank of America’s most popular cards. Looking for a card that will pay you in cold hard cash every time you use it? The Bank o﻿f Americ﻿a Cash Rewards Card offers 1% cashback on all of your purchases with an extra 2% back at grocery stores or wholesale clubs, and 3% back on gas for your first $2,500 spent each quarter. When you sign up for a Bank of America Cash Rewards card, you are also eligible for a $150 cash bonus if you spend $500 in the first 90 days after you open your account. You can also get an extra 10% bonus on your bonus if you’re a Bank of America customer and you redeem your cash back to your Bank of America checking or savings account. If you are a Bank of America Preferred Customer, you could get an additional bonus of 25% to 75%. 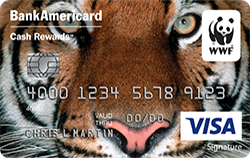 That’s a big bump in your savings, so if you get this card it would make sense to also use Bank of America for the rest of your banking needs. 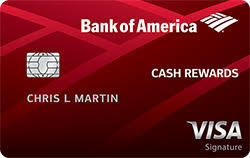 The Bank of America Cash Rewards card has no annual fee. Also, it has a 0% introductory interest rate on your first 12 months – which applies to both regular purchases and balance transfers made within the first 60 days after opening your account. After that, the interest rate is variable and between 13.99% and 23.99%. How much you will pay will depend on your personal credit and financial situation and fluctuations in interest rates. There is a 3% balance transfer fee with a minimum charge of $10. They also charge a 3% cash advance transaction fee. This is a great credit card in order to rebuild your credit score as it doesn’t require a significantly high score in order to qualify. It’s also a great card to help you establish credit for this reason. The benefits on the card are actually quite generous in comparison to other cash back cards. While they only offer 1% cash back on regular purchases, the larger 2% cash back on grocery and wholesale club purchases, and 3% back on gas will help you quickly boost your cash back savings. Since your cash back is boosted if you’re a Bank of America banking customer, this is one of the more generous credit card programs when it comes to cash back rewards. Another benefit is that the sign-up bonus is very easy to qualify for – unlike other cards where you have to spend thousands of dollars in order to get it. The interest rates have a broad range, but start relatively reasonable – so whether the card is right for you will depend on the rate you qualify for. The introductory interest rate of 0% for 12 months is great – especially since it is on both balance transfers and regular spending. In addition, the fact that there is no annual fee and it doesn’t require great credit in order to qualify for make this card one that everyone should consider. Like to travel to exotic locations and not have to pay for your plane tickets, hotels, or rental cars? With the Bank of America Travel Rewards Card, you might just be living your dream life! The card gives you 1.5 points for every $1 you spend on all of your purchases and your points never expire. If you’re a Bank of America customer, you can get an extra 10% bonus points if you have a Bank of America checking or savings account. Even better – if you’re a Preferred Rewards customer, you might even be able to increase your bonus by 25% to 75%. That will get you travelling sooner! In addition to generous travel points, the Bank of America Travel Rewards Card also offers a 20,000 miles bonus for signing up. You just need to spend at least $1,000 on your card in the first 90 days after opening the account. The card has a 0% APR introductory interest rate for the first 12 months on regular purchases. After that, your rate will be variable and between 15.99% and 23.99% APR. How much you will pay will depend on your personal credit and financial situation and credit fluctuations. There is a 3% fee for balance transfers and cash advances and there are higher interest rates on cash advances. There is no annual fee on the card. There are also no foreign transactions fees – which is a bonus because most cards (even many travel cards) charge 2% to 3% for foreign transactions. That means that you can use this travel card while you’re travelling without having to worry about getting dinged by fees when you get your statement. The card is best for those with above average credit. 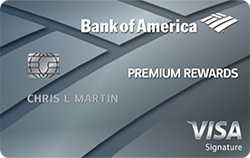 This card offers a very generous rewards program – especially if you’re a Bank of America customer or a Preferred Reward customer. These bonuses will ensure that you collect points faster. The introductory 0% interest rate is also a bonus, as is the fact that there is no annual fee and no foreign transaction fees. These benefits make it a unique among other travel cards which often cost more or don’t have these benefits. All in all, the Bank of America Travel Rewards Card is a good option. Want to get even more travel rewards on your credit card purchases and an even bigger sign up bonus? Look no further than the Bank of America Premium Rewards Card. This card gives you 2 miles for every $1 you spend on travel and restaurant purchases and 1.5 miles for every day purchases. These miles never expire while you have your card. In addition, the card offers other great perks like $100 each year for airline incidentals like checking your baggage, preferred seating, food and beverage charges on the plane, or in-flight entertainment. Every four years, you can also get a credit for enrolling in either the TSA Pre-Check program or the Global Entry Program. The card offers a 50,000 miles bonus when you sign up and spend $3,000 in the first 90 days after opening it. That is a value of $500. Unlike other cards, there is no 12 month introductory rate, but your rate begins between 16.99% and 23.99% variable APR. What you will pay will depend on your personal financial or credit situation, as well as changes in the prime interest rate. The card charges a 3% fee for balance transfers and cash advances and a slightly higher interest rate for cash advances. The card has a $95 annual fee and is best for people with excellent credit. There are a lot of benefits to getting the Bank of America Premium Rewards Card. In the first year alone, you could get $500 in travel points as a bonus, $100 in airline incidentals and up to $100 for the TSA Pre-Check or Global Entry program. That’s a significant amount of bonuses and doesn’t even include the points you’ll earn by using your card. While the annual fee is steep at $95, it’s pretty reasonably priced compared to similar travel cards that offer so many great benefits. If you travel frequently, you’ll be able to easily make back the annual fee every year by using the airline incidental credits since the costs of checking bags alone quickly adds up. However, the one big drawback is the fact that you don’t get a 0% introductory interest rate on your card. That makes this card not as good an option as the Bank of America Travel Rewards card for those who are carrying a balance on their cards. The Premium Rewards card is a better choice for people who don’t carry a balance because they pay off their cards at the end of the month. Do you have a balance on your card and you want to save on interest and pay it down more quickly? If so, the BankAmericard might be right for you. While it doesn’t have any fancy rewards, it does provide some benefits that rewards cards do not. For example, you get a 0% APR introductory interest rate for 15 months on both balance transfers and purchases. After that, your interest rate is a relatively low variable APR range of between 12.99% and 22.99%. What you’ll pay will depend on your personal financial and credit situation, as well as variations in the interest rate. In addition, there is a $0 intro balance transfer offer where you can transfer as much as you want onto your new BankAmericard within the first 60 days after opening your account at no charge. After that, you will pay 3% on balance transfers. There is no annual fee. In addition, the BankAmericard doesn’t have a penalty interest rate. Most cards will charge you a higher interest rate and fees when you pay your card late, but with the BankAmericard, your interest rate stays the same even after you miss a payment. This card is great for people with poor to average credit and people struggling to repay debt. If you are currently trying to repay credit card debt, this card might be the right one for you! From the very long introductory 0% interest rate period to the fact that you can transfer your balance onto the card in the first 60 days without a fee – this card is ideal for those who are looking to save money in interest and quickly pay down their debt. The downside is that you won’t be earning rewards points as you do it! Do you live, breathe, and sleep Major League Baseball? Of course you do! The MLB Card is a great choice for any baseball fans as it combines many of the benefits that you would get with the Bank of America Cash Rewards Card with the added benefit of supporting the team you love! This card offers 1% cash back on regular purchases, 2% back at wholesale clubs and grocery stores, and 4% back when you buy gas. If you’re a Bank of America customer already, you’ll get an extra 10% in rewards if you redeem them to your Bank of America account. Are you a Preferred Rewards client? Great – you’ll get an extra 25% t0 75% in bonus rewards. The card also has a sign-up bonus of $150 if you make at least $500 worth of purchases on your card in the first 90 days. The card has a 0% APR introductory interest rate for the first 12 months on regular purchase and balance transfers made within 60 days of opening your account. After that, the interest rate goes to 13.99% to 23.99% variable APR. What you’ll pay will depend on your personal financial and credit situation as well as the variations in the prime interest rate. There is a 3% charge for balance transfers and cash advances and no annual fee. The card is best for people who have average to excellent credit. 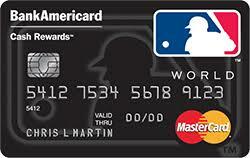 This card is a great option for MLB fans who also want to get a great credit card. The introductory 0% rate on both purchases and balance transfers is also a great benefit – but not as good at the BankAmericard when it comes to paying off debt since this card charges an 3% fee on balance transfers. However, if you want a good balance between having a card that offers rewards and helps you pay off debt, this is a good option. Want to help save animals and also get a great deal on a credit card? With the World Wildlife Fund card, you can multi-task! Similar to the Bank of America Cash Rewards card, you’ll get 1% back on your regular purchases, 2% on wholesale club purchases and groceries, and 3% back on gas. You’ll also get the 10% bonus on your points if you are a Bank of America customer and between 25% and 75% bonus if you’re a Preferred Rewards customer at Bank of America. Sounds like a great deal! When it comes to interest rates, you’ll get 12 months of 0% interest on both regular purchases and balance transfers. After that you’ll pay between 13.99% and 23.99% on all purchases and transfers. How much you’ll pay will depend on your personal financial and credit history. You’re also eligible for a sign-up bonus with the World Wildlife Fund Card. You can get $150 if you spend at least $500 in the first three months of owning the card. Since it’s a relatively low amount – it’s easy to earn. There is a 3% fee charged on all balance transfers and cash advances, but one bonus is that the card has no annual fee. The card is best for people with average to excellent credit. There are a lot of benefits to the World Wildlife Fund Card. The biggest one might be that it helps animals – if you’re an animal lover. But you’ll also get great cash rewards benefits, a good sign up bonus, and a reasonable interest rate, and no interest for the first 12 months. Ultimately, if you’re thinking of getting the Cash Rewards card, but you also want to give back you should get this card instead! Like to fly places that Alaska Airlines goes like Hawaii or Alaska? If you do – you’re in luck! 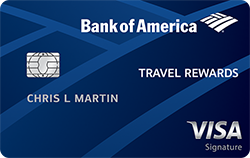 The Alaska Airlines Visa Signature card is a very popular travel card offered by Bank of America. What makes it so great? First of all, they have a Companion Fare bonus – where you get a free ticket for a companion every year when you purchase one for yourself. You also get free checked bags for yourself and up to six other passengers, and an annual $50 discount on airfare. You can also earn 3 miles for every $1 spent on Alaska Airlines and Virgin America and 1 mile for every $1 you spend on other purchases. In addition to this, there is an additional 30,000 bonus miles sign-up bonus if you spend $1,000 in the first 90 days after opening your account. 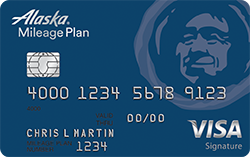 The interest you’ll be charged with the Alaska Airlines Visa Signature card is also relatively reasonable with a variable APR starting at 13.24% and going as high as 20.24%. How much you’ll be charged will depend on your personal credit history and fluctuations in the interest rates. There is a 3% fee for both balance transfers and cash advances. The card has a $75 annual fee and is recommended for those with good to excellent credit. The Alaska Airlines Visa Signature Card is a great option for a travel rewards card. For a low annual fee of just $75, you get a number of great travel benefits such as one annual companion fare, a $50 voucher, and free checked bags. Those benefits add up to several hundred dollars or more worth of benefits – and that doesn’t even include the miles that you would earn by using your card. The sign-up bonus is relatively generous and easy to earn since you only have to spend $1,000. In addition, the interest rate range is relatively reasonable compared to other cards. While you don’t get an introductory period at 0% interest with this card, whether or not that’s important to you will depend on how you use your card. If you’re carrying a balance on it, you might be better off getting another card, but if you want to earn a significant amount of rewards points, then the Alaska Airlines Visa Signature Card is a great option. Before you sing up, however, make sure that Alaska Airlines serves your town and the areas where you want to travel to. Which card will be right for you will depend on your personal financial situation and needs. If you carry debt on your card and are looking to pay it off then you’ll benefit from a card that offers a 0% introductory rate on balance transfers and regular purchases. If you are looking to earn great rewards, you’ll want to check out the cash back and travel cards and figure out which will give you the best benefits for your lifestyle. Jeff Gitlen writes about a wide range of finance topics including everything from student loans to credit cards to small business financing. 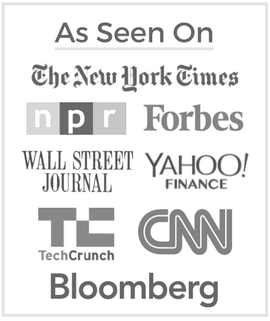 Jeff's work has been featured on a number of sites including Bloomberg, CNBC, Forbes, Market Watch, and more.